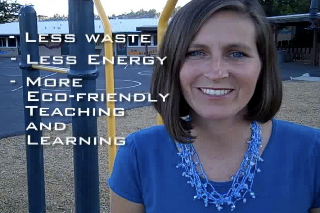 Tricia Elisara explains the benefits of green classroom party kits in her video entry for "The Green Effect. Sun Chips and National Geographic have joined efforts to make the world a greener, better place through creating The Green Effect — a contest offering $20,000 to five contestants with earth-saving ideas. Biola alumna Tricia Elisara happened upon The Green Effect contest and is one of ten finalists from 2,500 submissions around the nation that may have the chance to take their entry from idea to action. “Can one person make the planet greener, better…happier? We think so. Because big change starts with small steps,” summarizes Sun Chips philosophy, according to the green effect website. Elisara’s husband found the contest accidentally on YouTube one day and knew it would be perfect for the idea she had pioneering at their local public elementary school in Julian, Calif. As a parent volunteer at the school, she realized how much waste school parties incurred through disposable paper plates, cups, and more. “Considering all of that disposable dishware and the unnecessary cost to parents and teachers involved, I thought that there must be a better way to do it,” said Elisara. The contest asked for ideas that were simple but potentially could make a big environmental impact. Elisara’s “Green Classroom Party Kits” idea will do just that. Her idea capitalizes on the idea of re-using. A green classroom party kit would eliminate the cost and waste of paper products through providing reusable white plates, clear cups and silverware all in a rolling storage container for each classroom at a school. After using them, children learn to scrape plates, pack them in the rolling storage cooler, take it to a staff room or cafeteria, wash them and then store them. This idea saves waste, energy and kids will learn the habit of reusing. The grant money of $20,000 would be used to create 100 green classroom party kits to outfit each classroom at Julian Elementary School and then distributed to 80 more elementary schools in San Diego County. Elisara believes the idea could catch on with some publicity since it is unique and easily replicable. She said the contest has been exciting and fun. “The process has been wonderful — it has not just been about garnering votes, it has been about talking big ideas — creativity, change, community, involvement, stewardship,” said Elisara. Judges will select the top four finalists and online voting will determine the fifth finalist to receive $20,000 as well as a trip to Washington D.C. in the fall for a National Geographic Society Event. Online voting is open through July 20, 2009 and users can vote once a day for their favorite entry. Read more about the contest and vote for Elisara’s Green Classroom Party Kit.